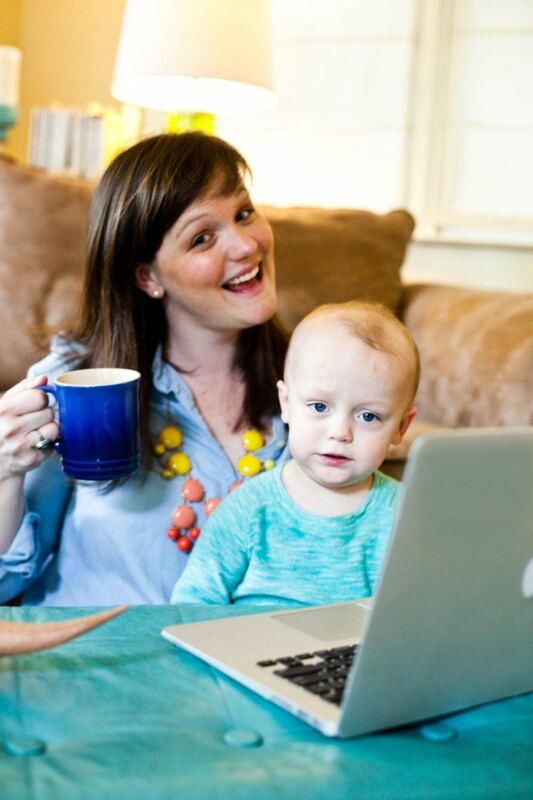 ​Thanks to Elizabeth Chapman for reporting live from the teaching trenches & giving us an update on how things are going since she joined Angela Watson's 40 Hour Teacher Workweek Club - as well as sharing tips for how YOU can end the crazy overwhelm, too. When I'm not rushed, using my systems, sorting everything into its proper pile, and staying on top of the loads, things go well. 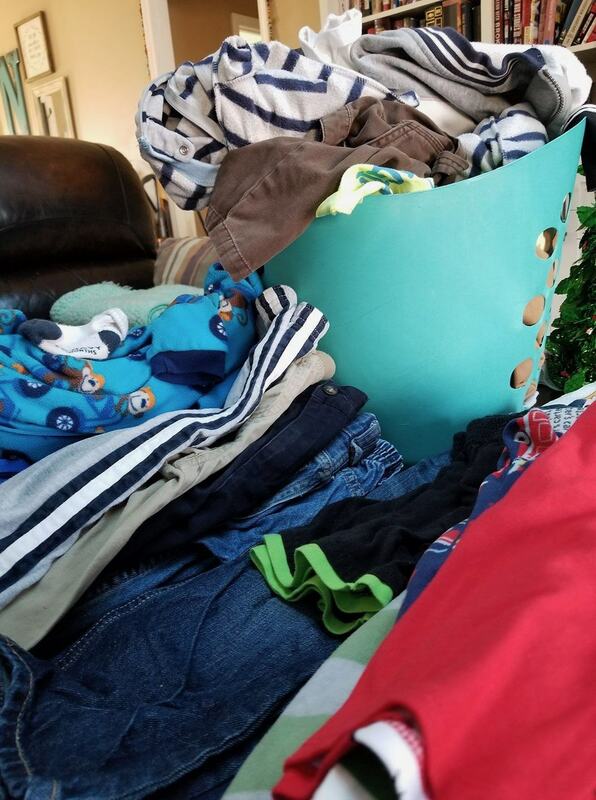 BUT, every once in a while (OK, more than I care to admit), I find myself standing in the laundry room with mounds of dirty clothes as tall as me, and I need a nap just thinking about how much work it's going to be to dig myself out and get back on track.. I'm Elizabeth. I'm a wife, mom, and high school English teacher in Virginia. This school year, I was desperate for something to change. So, when Linda invited me try out the 40 Hour Teacher Workweek Club and report back "from the trenches" on my experience, I - naturally - jumped at the opportunity! I still felt passionate about my calling to the classroom, but I knew I couldn't keep living with the constant weight of being behind. I wanted to regain control of my time at work and get back to a place where I felt confident in my abilities to be an excellent teacher and to manage my other responsibilities both at school and at home. 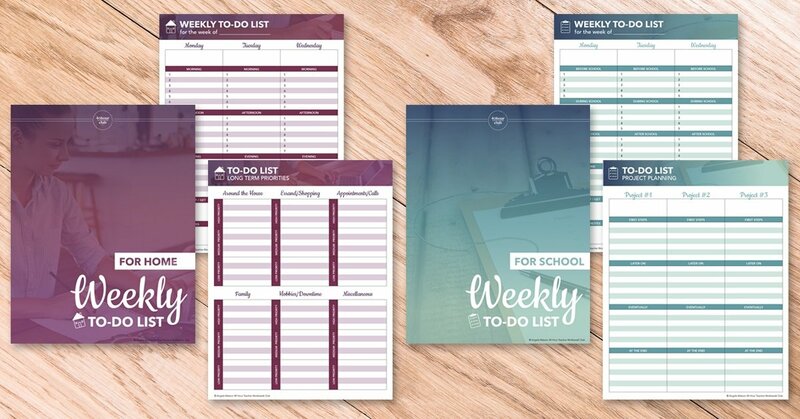 Over the summer, I signed up for Angela Watson's popular program and vowed to make 2017-2018 a better school year by implementing some of her proven strategies to run my classroom more efficiently, get organized, and make time for all the things that matter to me. This year has been better. A lot better, in fact. Like I said I would, I took time over the summer to rest and re-charge, and the July and August Club materials helped me start the school year feeling more prepared. This year, with help from the Club (and a good bit of grace for myself), my "crazy cycles" have been fewer and farther between; BUT, it's still not been perfect. Leaks still spring. Things still get off-balance. The biggest difference this year, though, is that I now have the tools and the support I need to STOP the crazy before the cycle gets out of control. I've learned to sort my piles more effectively so that one "red shirt" doesn't ruin everything. I've got a plan for staying on top of my loads. And, when things still get a little nuts, I have resources and a community to turn to for help. Maybe you already know about the 40 Hour Teacher Workweek Club (40HTW) - a year-long online program that claims to help teachers be intentional and efficient with the time they have AT WORK so that they can make the most of the time when they aren't - but you wonder if it will be just "another thing" you don't have time for. I've been there too, and my goal today is to walk you through my own experience these first six months in the club with honesty and authenticity, offer a few "bonus tips" you can take for a test drive RIGHT NOW, and answer some of the biggest questions I had when deciding whether or not to sign up. Listen, I'm a teacher too: I know how precious your time and money is, and I want you to feel 100% confident in your investment for a better quality of life. Does the 40 Hour Teacher Workweek Really Help? The club launched in July, and I immediately gained access to a wealth of resources!! Actually, truth be told, it was a little overwhelming at the beginning! (Told you I was going to be honest.) I was at the beach when things officially got started and still "recovering" and taking some much-needed time off. So, while I skimmed my emails from Angela and casually looked over the course dashboard in July, it was early August - you know, that time when every teacher starts slowly getting his/her head back in the game - before I really sat down and got started. Thankfully, it was easy to pick right up and dive in! The entire course is impeccably organized (seriously, I have very high standards for that kind of thing) and easy to navigate. The "Getting Started" page guided me, step-by-step, through all the technical and logistical things I needed to work out in order to get the most from my experience - like how to listen to the audio and how to add the Club to my iPhone home screen. 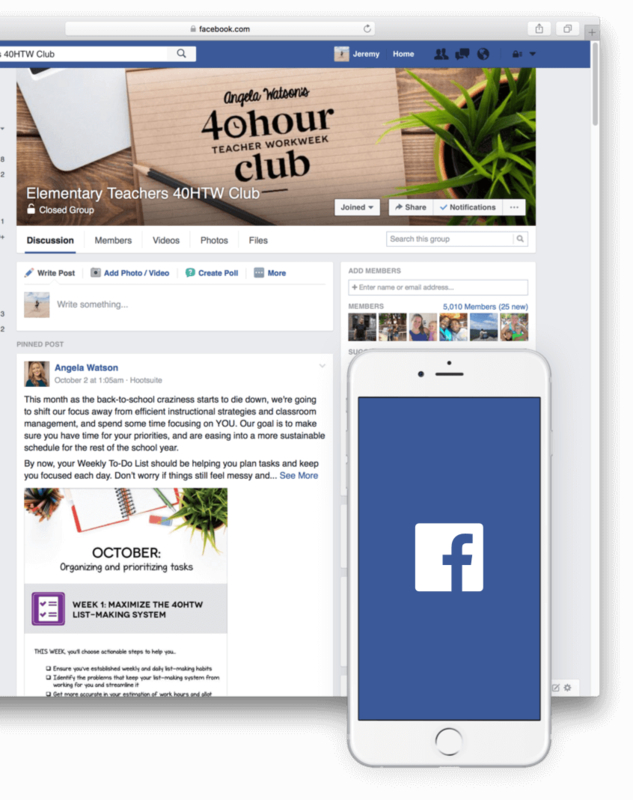 I also found a link to join the 40HTW Facebook group (mine is set up specifically for secondary teachers in the July 2017 cohort) and instantly gained more than 900 colleagues/friends to collaborate and commiserate with (truly, one of the best parts of the club). From there, I spent some time reviewing the "Bonus Lists & More" section of the course and found Angela's "Big 5 Tips for Teacher Productivity" to be the perfect overview of the course's general tone and focus. Even now, I find myself going back to that simple list whenever I'm not sure where to go / feel "the crazy" coming. In fact, most of the biggest changes I've made to my own routines and habits have come from those five things - like prioritizing The Main Thing and doing it first, avoiding unproductive multi-tasking and batching like-tasks into longer timeframes instead, and relaxing some of my personal standards that don't really affect anyone else (for example, only putting the chairs up on the desks for a good sweep on Fridays instead of every day -- the custodian probably wasn't sweeping every single day anyway -- or not wasting time re-stapling papers that make my piles look messy -- yes, I've done that). Set aside one afternoon a week (or two if you need to/can) to stay after school and knock out a big stack of grading in two hours or so instead of trying to squeeze in a paper here and a paper there throughout your days. Don't do anything but grade during that time! You'll be surprised how much you can get done once you "get in the groove." Then, reward yourself by leaving school at a normal time the other three or four days and NOT spending your nights/weekends with a red pen in hand. The other thing I found incredibly helpful right at the start of the Club was the 40HTW List-Making System. (FYI: This is provided as a bonus material - meaning you have access to the templates etc. from the moment you enroll - but there's a whole week+ devoted to the system later in the program.) I've always been a big fan of lists and calendars, but in the past, I've kept one giant To Do list for school that was, even on a good day, headache-inducing AND a big list of things I needed to do outside of school (like, um, laundry) inside my personal planner. For instance, I added a "Top Priorities" category at the top of each day's column for myself where I list out the three things that *need* to get done and try to cross those off first before I do anything else. I also combined her school and home lists so that I just had to look at ONE column every day. Pick THREE things that are your top priorities for each day. Aim to accomplish those things first - either at the start of your day, the start of your planning period, or just as soon as you have a minute to make progress. Whatever you do, don't fall into the trap of thinking you can check your email or chat with a colleague "real quick" first. Then "reward yourself" with easier tasks (or, OK, even a short visit with your teaching friends) once you've done these. Promise to feel good about your day as long as you get those three things done -- everything else is just icing on the cake! It took me a little while, but I've gotten in the habit of spending 10 - 15 minutes each morning planning for the day ahead on paper (I print out a blank list every Friday afternoon to be waiting on my desk on Monday morning). While I still have my one big list on my computer, I use it and my planner/calendar (to account for scheduled meetings etc.) to see the big picture then write out what, specifically, needs to be accomplished (and when) on that day only. I like the white space for potential for each day that hasn't come yet, and it keeps me from being frozen in my overwhelm of all that I *should* do but can't possibly be completed in one day. Even better, I find I'm actually getting more done in a day too!! Don't leave anything sitting on your list at the end of a day. If it isn't checked off, move it to the next day (or another day) and cross it off. It seems silly, but the simple satisfaction of feeling like you are DONE with one day and have accomplished all you can goes a long way in terms of motivation and confidence. And ALL the printable materials you need to get started practicing what you've learned. Seriously, Angela has thought of EVERYTHING. July and August both focused on starting the school year strong by setting up a "self-running classroom" where the students take ownership for the space and establishing "sustainable systems" that help you to be purposeful about your organization and procedures. These lessons were, obviously, very timely, and helped me step back and evaluate some of the things I'd been doing for years but never really thought about before. Thankfully, I'm pretty organized by nature so I already had a good design for my classroom, had pretty clear classroom procedures that my students knew and followed, and had a designated place for every paper. BUT, I also had a few lightbulb moments in these early months - like when I realized I spend WAY too much time doing things that my students could do FOR me. For example, I now have one student alphabetize papers for me after they are turned in for easy entering into the grade book, students that handout papers and return work for me, and students that wipe off my tables in the last class of each day. I never realized how much time I was spending doing those things, but it has made a HUGE difference to ask for help and - even in high school - the kids actually love doing these simple jobs! Alphabetize papers before you grade them (or, at least before you attempt to record them) so that you can enter scores into the grade book quickly without having to search around for students. ALSO, if possible, write students' grades on the LAST page of the assignment (instead of the first one) so you can have a student return papers for you later without risking confidentiality. *Obviously, this second tip won't work for every classroom or every assignment, but my students are mostly respectful and trustworthy, and it has saved me a lot of class time! One thing Angela stresses in the beginning is that the 40 hour work week won't be possible (for most teachers) at the start of the school year. She suggests that we plan to work REALLY hard (including, in many cases, longer hours) the first 6 - 8 weeks of school in order to set ourselves up for a more efficient rest of the school year. Stop doing other things that won't really make a difference in the long run. Even still, by September, I felt a bit behind with the Club's materials (again, just keeping it real). That month was all about developing "efficient routines for learning" that streamline student work habits, small groups, centers, etc. 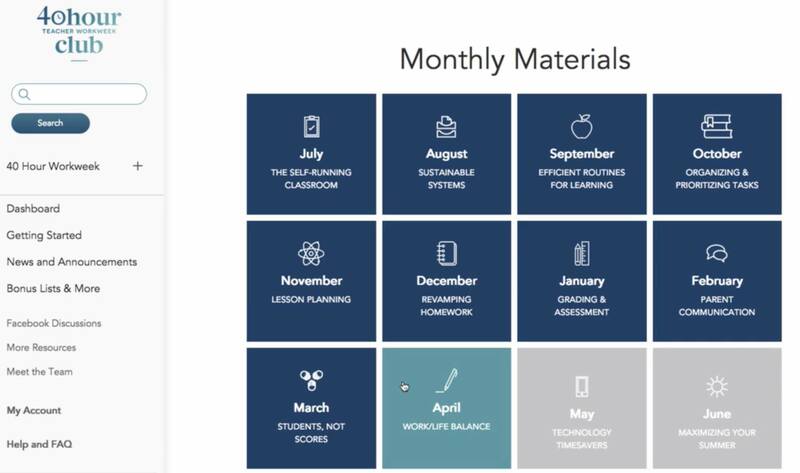 I was actually super interested in improving my student-directed and collaborative learning game; but, I just didn't feel like I had the time and energy to fully focus on all the resources that month. It's easy to fall into a rut of always just saying "find a partner" and letting students work with the same person all the time. To break that habit, try having students schedule "appointments" with their classmates. At the start of class (or, even, the week/month/term), have them set up a 9AM, 11AM, 1PM, and 3PM appointment - each with a different classmate - and write them down on a schedule page you prepared in advance (or just a piece of scratch paper). Then, later, when you need them to work with a partner simply tell them to meet with their "9AM appointment" and so on. My students find this simple change so fun, and it makes pairing up MUCH faster and more diverse. In October, we got back to the 40HTW List-Making System (that I'd already been using for a few months by this point) and shifted our attention to "organizing and prioritizing tasks" to decide what's truly important, get it done, and forget everything else! To choose a target number of hours to work each week and allocate time for specific priorities. I found that a couple of hours of dedicated work time each day actually WILL fit into my schedule and will keep me from having to take a ton of work home. My favorite lesson this month though, was the last one - on overcoming procrastination. I didn't use to think I was a procrastinator, but man does teaching (in particular, grading) bring this side out of me! In Week 4, Angela offered some great advice for overcoming procrastination - like planning intentional downtime and rewarding myself when I get something unpleasant done - and I came out of October with a game plan for tackling some of my biggest struggles with productivity. Finally, now that she had our routines and schedule mostly running smoothly, Angela got down to the nitty-gritty specifics of lesson planning and managing homework in November and December. Start batching my long term planning with a more holistic approach. In addition to reviewing December's tips for how to simplify my homework system and keep students motivated and accountable for it, I'll also use winter break to actually rest and rejuvenate - which is important enough that it gets its own week later this month, too. ​Spend 30-60 seconds at the end of each school day making a quick note for yourself about what worked and didn't work that day. This reflective practice is actually really good for you, and the notes will be INVALUABLE when you get ready to plan for next year!! To conclude, if all this sounds like a lot, that's because IT IS!!! You get A LOT of bang for your buck with this program; but, the reality is, there's just NO WAY you could possibly do everything the course recommends or read every resource provided every week - and Angela knows that. 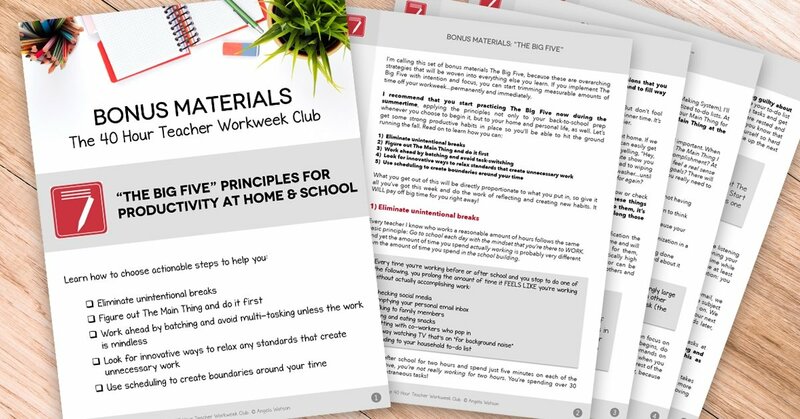 To that end, one of my favorite aspects of the Club is that every month's materials include a "Blueprint" with a short summary of each week's materials, a checklist to make sure you're staying on track, and one thing to do "If you only do ONE thing this month." Angela knows what it's like to be a teacher, so she's truly designed a program that can work with YOUR schedule instead of being just something else to "squeeze in." Though the program technically runs 12 months, for me, it has helped to think of the 40 Hour Teacher Workweek as a tool I will use and go back to throughout my career. For now, I keep a binder specifically for 40HTW materials and print each month's blueprint. There, I star things I want to come back to and make notes for myself as I listen to the audio/skim the materials each week. 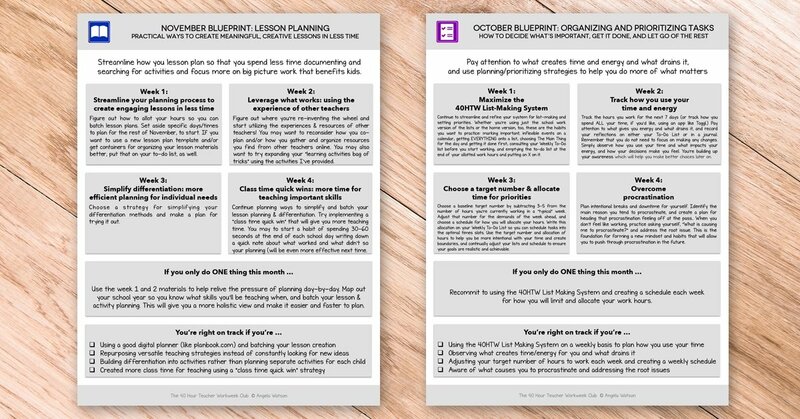 Then, I usually pick one or two lessons to print out and only one or two actual strategies from each of those lessons to implement. As I mentioned above with the lesson planning resources, I plan to come back to MANY of these units/lessons and dig deeper as time allows, but I'm showing myself grace and taking it one step at time for now. The good news? Even that is working!!! Eleven years in, I know teaching is NEVER going to be perfect. I'm still going to have weeks, months, and maybe even entire school years where my loads keep piling up and things get crazy. BUT, I'm determined not to let myself get stuck on that cycle again and risk ruining the joy and passion I have for this important work. As I reflect back on the first half of this school year, I'm incredibly grateful for the resources I have found through the 40 Hour Teacher Workweek Club and the awesome community of support provided on the FB page. If you are stuck right now - staring at your piles, paralyzed by overwhelm and anxiety - I can tell you, with confidence, that there IS hope for change. My prayer for this post, first and foremost, is that you will be encouraged and know you are not alone. We ALL have good and bad seasons of teaching and of life; but we are fortunate to be in a career that offers a new start - every new school year, new semester, new quarter, new week... Even every new morning. It is NOT too late. Likewise, I hope you've found a couple of useful tips above that you can start using TODAY to make your days and your classroom run a little smoother. AND, if you feel so inclined, I hope you'll feel sufficiently informed about the 40 Hour Teacher Workweek Club to make the investment in yourself and your career and join the next cohort. The club opens for enrollment a few times a year, so click the link below to find out more about the club & get on the waitlist to be notified when you can join. In the meantime, if you have more questions or just want to chat please don't hesitate to contact me via email at samandscoutblog@gmail.com or reach out to Linda (she's long been a supporter and affiliate of Angela Watson and will be a great resource as well). From one crazy teacher to another, you've got this!!! Here's to a happier, healthier, more balanced 2018! Disclaimer: Elizabeth received compensation for the time and energy required to put together this extensive review of the 40 Hour Teacher Workweek. Teach 4 the Heart is partnering with Angela Watson to help spread the word about this amazing program. If you enroll in the club after clicking one of the links above, Teach 4 the Heart will receive a percentage of your enrollment fee at no extra cost to you. If for any reason this makes you uncomfortable, you can simply google "40 Hour Teacher Workweek." Please know I am only recommending this program because I know it's amazing and believe it will be a great help to you. I'm Elizabeth, but you can call me E. In a nutshell, I am a Jesus-follower, wife, mom, and teacher in southwest Virginia. In my "spare time" (ha), I blog at Teaching Sam & Scout about my life as Mom to Sam (almost 6) and Nora (2) AND as an English teacher to 100ish students (15 - 17) in a public high school. I'm super passionate about making things "work" in both of those roles (mom and teacher), and I love to encourage other teachers, moms, and teacher-moms in their own juggle with honesty and authenticity.